The Arches is immaculately appointed with beautiful, sturdy, Caribbean wicker furniture throughout. With the split villa design you can vacation with your friends and yet have a total sense of privacy. The villa, with 3 bedrooms and 3 baths, is designed with the master bedroom suite separate from the main house. This suite offers a wet bar with refrigerator, private sitting area and large bathroom. The main villa has two bedrooms, 2 bathrooms, large kitchen, dining area, a very spacious living room and is beautifully tiled throughout. 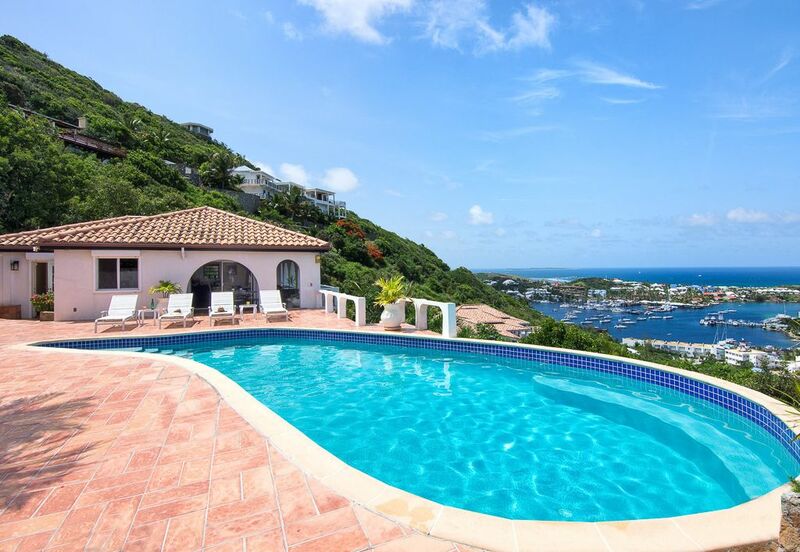 The pool is centered between the main villa and master bedroom suite and is surrounded by the lounging deck that has the same Terra Cotta tiles as the main house and master bedroom suite. Master Bedroom Suite Located separate from the main villa offers a wet bar with refrigerator, private sitting area and large bathroom with shower. The bedroom has a King Bed, air conditioning, ceiling fan, TV/VCR and porch. Bedroom #2 Located in the main villa has a King Bed, air conditioning, ceiling fan, en-suite bathroom with shower and porch. Bedroom #3 Located in the main villa has a King Bed, air conditioning, ceiling fan, en-suite bathroom with shower and porch.